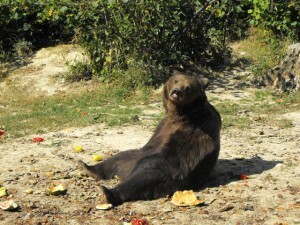 I have just returned from 2 weeks working in a Bear Sanctuary in Romania, and it was an amazing experience. The first surprise was Brasov and how beautiful and cosmopolitan it was. A lovely square with brightly coloured houses, churches and lots of outdoor cafes and restaurants, with lovely cheap food. The following day our guide Rasvan had organised a hike in the Carpathian Mountains. The scenery was dramatic, canyons and forest and the view from the top was incredible. After a day spent travelling it was fantastic to stretch my legs and breathe in the lovely fresh air. Monday was the first day at the bear sanctuary which was also in an incredible location with beautiful views all around. The first thing that strikes you is the size, 69 hectares of it certainly keeps you fit! Every day we received a welcoming committee of the very friendly sanctuary dogs. Then it’s your first sight of the bears. The first day I was invited on one of many tours around the sanctuary. This gave me the perfect chance to get an orientation of the sanctuary and meet the bears and learn about their history. We were there to work though, although it didn’t seem quite like work when you always have between 1 and 10 bears watching what you are doing! A large part of the work was food prep, the bears eat a ton of food a day. Betsy, the 30 year old fluffy bear from the USA could always be relied on to watch avidly whilst we were preparing the meat. Lots of food is donated by local supermarkets as it is past the sell by date. The van arrives several times a day. All the meet needs to be removed from its packaging, as does the fruit and vegetables. One day we had to remove the packaging from hundreds of cucumbers. Yoghurts, cheese and milk are also poured into containers. The bears loved dairy, chicken, sausage, melons and peaches. Whilst we were there we also did some work on the new enclosure. We cleared the weeds and land and it was very gratifying to know that on the day I was flying home the 2 quarantine bears Zorro and Mischa were moving into their new home, complete with pool. We also did a little haymaking. The weather was beautiful, the skies blue and the bears always kept us entertained with their antics. On a morning we had a little routine. First we’d visit the quarantined bears. It was marvelous to see the change in little Mischa. She used to sit chewing her foot and making soul wrenching noises. This is typical of bears who are taken away from their mothers too early. However, as she got used to her surroundings and to us she’d come to greet us and was full of fun, splashing in her water container and rolling onto her back. Next stop was Max, the blind bear and a particular favourite. He sits smiling and comes to greet us. We also got the wolves to be more comfortable around us. Lunchtimes I went to one of the many pools to watch the bears frollicking and swimming. There are always things happening to keep us occupied in Brasov on evenings. Whilst we were there a stage was erected in the square and the Brasov Philharmonic Orchestra performed, even giving a rendition of Land of Hope and Glory. The next night was the opera and the weekend was taken up with the Brasov Oktoberfest with music, food and beer. At weekends Rasvan organised activities. Saturday we visited caves, Rasnov Fortress and Bran Castle. There are many things I shall miss, the lovely scenery, friendly people, good food and wine but most of all the bears. I have some incredible photos and some equally incredible memories. I would recommend this programme to anyone, any age, you wont regret it. Previous Post Love sharks? &#8211; Don&#8217;t let horror stories prevent your great (and safe) experience in marine conservation!